Lake Tahoe is known for its cool year round temperature and top quality granite. 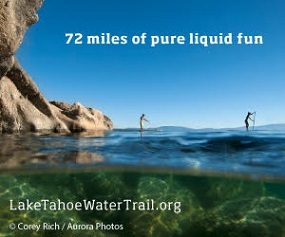 Lake Tahoe is also known as the place with an open canvas of developed and undeveloped rock. 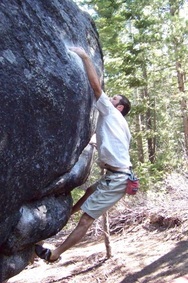 In fact, Lake Tahoe bouldering has exploded in the last few years with world class boulders around every corner. To make it even more exciting, a “high line” feature over a 50X50 foot air bag has been added, and the dyno wall will also be over a 30X35 foot air bag. This should add a great atmosphere for visitors and competitors. 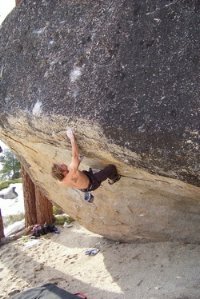 Some of the best developed climbing in South Lake Tahoe is on the numerous granite boulders scattered throughout the community of Meyers. Around 100 problems will be included in the contest ranging from V0 to V12 and beyond. Get out and climb, meet other members of the climbing community, and celebrate the outdoor adventure lifestyle. Route finders have specifically designed the contest for all ability levels to make this event fun for the beginner or the pro. Friends, competitors and spectators will cheer on climbers to test their ability on Tahoe’s scenic granite boulders while turning on the crowd to climbing. Prizes will be awarded to top finishers in all divisions and categories. For more information, visit www.tahoebouldering.com.